Select wanted subs/audio/video track to be kept in the output files. Select certain chapters in a source MKV file to convert at will. More than converting MKV files, the Video Converter can transcode MTS, MXF, TiVo, MOV, TS, VOB, AVI, and WMV files. If you have files like *.mkv or *.mka and want to edit and playback them on your gadgets like Apple TV, iPad, iPod, iPhone 3G, iPhone 4, PS3, Xbox, WD TV player, PSP, BlackBerry, Creative Zen, iriver, Zune, etc., you may need Pavtube MKV Converter. This program allows you to edit and convert Matroska files MKV to other formats including MP4, VOB, 3GP, AVI, MPG, MPEG-4, FLV, MOV, 3G2, VOB, MP3, FLAC, MKA, OGG, WAV, AC3, M4A etc. which can be used on various portable devices. Pavtube MKV Converter is able to recognize all audio tracks, subtitles streams, as well as video tracks in a MKV container file, so it enables users to select wanted subs/audio/video track to be preserved in the output files at will. The program adopts optimized audio and video in sync technology, which keeps you away from audio and video out of sync issues. 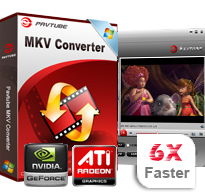 Pavtube MKV Converter takes full advantage of NVIDIA's CUDA technology and ATI Stream (AMD APP) technology to largely accelerate conversion speed. The GPU acceleration saves users lots of time when using H.264 codec to do format conversion. NOTE: To use GPU computing feature, a CUDA-compatible NVIDIA graphics card or an AMD graphics card with AMD APP technology must be installed. The CUDA and AMD APP acceleration both work only when creating H.264 encoded video files. With Pavtube MKV Converter, you can add three types of watermark to your source MKV video, including text watermark, image watermark, and video watermark. The video watermark enables you to experience an picture-in-picture effect. If you wanna combine multiple MKV files into a single file, you can check the option "Merge into one file". And if you wanna cut off black edges of the source file, you can use "Crop" function to do that. The program provides users with snapshot function, which allows you to capture the thumbnails as your wallpapers or editing elements for future use. The program provides users with "Shut down computer after conversion" option to avoid you waiting around for the entire conversion process. MP4 (supported by iPod, iPhone, iPad, PSP, Apple TV, Gphone, Blackberry etc. ), 3GP (supported by 3G mobile phones), FLV (suitable for online transfer), MPEG-4 (support importing to iMovie, Final Cut Pro. ), AVI, MPG, MOV, 3G2, VOB, MKV. The software is working perfectly!Simple and very straight forward in what you want to do. For that I thank the development team. I have a few movies I have downloaded in MKV format. My file output is VOB. I learned this is what DVD players use. I watch a movie, save it and if my friends or family want it I convert and burn it for them. In my search to find a simple to understand, use and enjoy I found Pavtube. I had to download and try about 15 different programs. From Super to Xilisoft. Most of them were too difficult for the average person. I prefer the program I use just works. Simple settings, no need to play around with 75 different settings to get what I want. I did try your free trial first. I had to decide which one best worked. I will be deleting them all and cleaning up my desktop now that have found what works. After I used your free trial and realized, it just works. Even with the water mark I knew this was the product for me. I purchased right away. Q:I ever ripped and converted many movies with Pavtube using the Apple TV output formats. Those movies played like a charm before on my Apple TV2, iPad, iPhone and even iPod Touch. However, after I updated my Apple devices to iOS 4.3 the sound cannot be played anymore. There's only video without sound. I find all my movies are encoded with aac 6 channels (5.1 channels) that do not work. If I changed the audio to stereo (2 channels) my Apple TV2 works again. I am afraid the sound problem is caused by iOS 4.3, but would like to hear your opinions how to settle it. We are not sure whether or when Apple will settle the iOS 4.3 6 channels sound playback problem. Presently to settle the sound problem with Pavtube you can click the Settings button and choose audio Channels to stereo (2 channels) instead of 6 channels (5.1 channels). We are also updating our Pavtube software to make adjustments to the Apple TV output profiles to settle the sound problem. Please keep tracking the update information from our website. Once the update gets released users can download the latest version from the download link they first downloaded Pavtube after purchase. How to enjoy HD MKV Movies with eeePad? 2. Other operational functionalities optimization, such as seek, interlace detecting, etc.